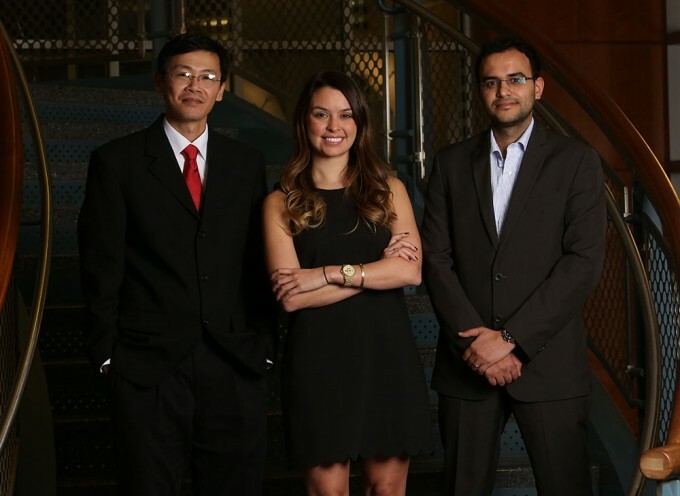 A team of five graduate students from the C. T. Bauer College of Business at the University of Houston, including from left) Juan Chang, Allison Piccirillo and Shantanu Rathore, and (not pictured) Rehan Jaliawala and Wenjun Chen, brought home the gold from the LINKS Global SCM Competition, which ran during October and November. As far as supply chain management (SCM) projects go, this one had plenty of suspense. The cost of raw materials for the business suddenly shot up 50 percent. Transportation was unreliable. Research studies had to be ordered and paid for. C. T. Bauer College of Business at the University of Houston mastered it. The five — Juan Chang, Allison Piccirillo, Rehan Jaliawala, Shantanu Rathore and Wenjun Chen — won a Gold Medal in the LINKS Global SCM Competition, which ran during October and November. Altogether, a total of 32 teams and 136 participants participated in the eight-round match-up, sponsored by LINKS Simulations. Each team operated as a “firm” working in five distinct “industries” of the set-box manufacturing sector. The teams came from Pennsylvania State University (15), University of Houston (six), Florida Atlantic University (5), Purdue University (three), University of Wisconsin-Superior (2) and the Brazilian institution Insper (one). Gold medals were awarded to the top two teams from each “industry.” Bauer’s gold medalists shared their victory with Penn State. Dr. Gordon Smith — assistant clinical professor of Supply Chain Management in the Department of Information and Decision Sciences — organized the Bauer teams. Smith has used LINKS Simulations in his classroom for three years and believes the LINKS model provides an excellent hands-on experience. “We find this to be a valuable way of getting students to learn,” he said. Though the LINKS scenarios are simulated, they play like a real-life game of supply-chain chess. Once the students enlist in the completion, Smith explained, they are presented with financial and operational information about their firm. They must then determine a strategy, perform analysis and make decisions about sourcing, manufacturing, logistics/distribution and product pricing. Within hours after the decisions are made, they receive their results, measured against standard business key performance indicators (KPIs). Then they move on to the next round, analyzing the past period’s results and making decisions for the next round of the simulation. Rathore said the competition proved to be a great lesson in an area in which he needed improvement. Being on a winning team just sweetened the pot. Smith, for his part, is on a winning streak with student competitions. Earlier this year, he led three teams of Bauer MBA students to victory in the APICS West Coast Student Case Competition. Under his guidance, the Bauer teams won first, and second and third place in the APICS Association of Operations Management competition’s graduate division. Currently, he is preparing Bauer students for the 2014 APICS West Coast Regional Case Competition, to be held Feb. 21-22 in San Francisco.